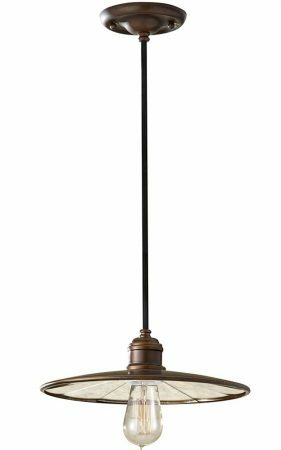 This Feiss Urban Renewal 1 light industrial pendant in astral bronze with height adjustable rods, features antique mirror glass on the inner shade for a stunning look. With a circular ceiling mount and drop rod supporting a wide brimmed coolie style shade finished in astral bronze. The inside of the shade is lined in antique mirror glass that will reflect the light and features a bare lamp bulb for extra retro feel. The Urban Renewal 1 light industrial pendant in astral bronze is designed in the USA by Feiss, founded in New York in 1955. They have become well known over the years for their contemporary yet classic styling, quality and great original designs. Feiss continue to maintain the highest standards in materials and workmanship to this day.